"How can I want you so badly when I have you already?" The Stone held an open mic tonight and Gillian was delighted to attend and sing two cover songs. Her voice is starting to really take shape and her stage presence keeps getting better and better. Gillian cannot wait for the nest open mic there. After a much needed break, Gillian is back at it! 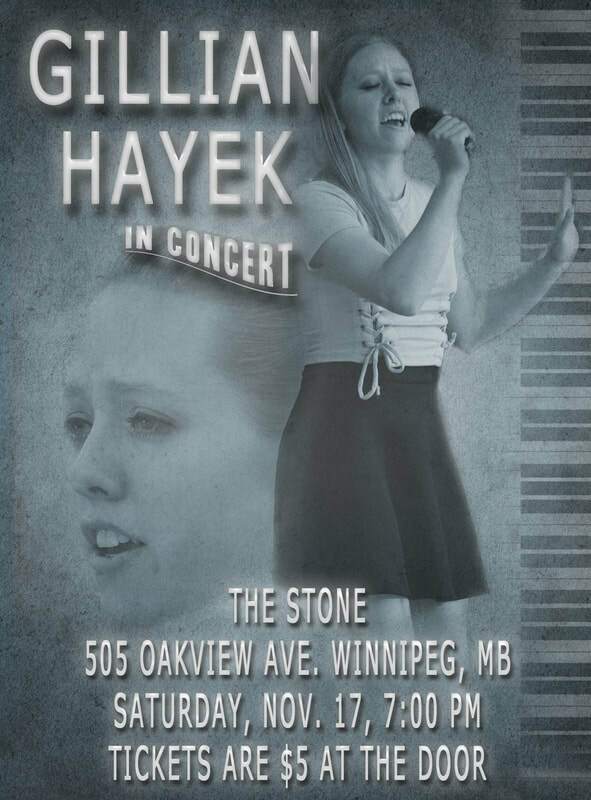 She attended another open mic at The Stone where she got to perform 5 songs. Gillian was happy she took a break from performing for the holidays as it gave her a chance to work on her voice, which improved drastically. She was happy to test it out at The Stone and was very grateful that she got to play so many songs as she is still learning how to properly sing with these new changes. Practice makes perfect! DJ Lyer from CKUW 95.9FM invited Gillian onto her segment "Listening Pleasures" to talk about her music and upcoming concert. Gillian was extremely excited and kept her composure when her iPhone wouldn't connect to play her songs. She had brought her ukulele along just in case, so she played all of her songs live, which worked out really well. Some of the listeners even thought they were professional recordings and not live performances! Overall, Gillian was extremely happy with how it went and is thankful for the opportunity. Gillian was the first act at her local community's "Raise the Roof" Fundraiser. Cook's Creek Community Club has taken on a huge expansion project that Gillian is excited for as there are plans for a stage to be added in the expansion. She was the first of three local performers. After her, Steve McBey performed a fun-filled set, and the final act was Juno Award Nominee Del Barber. It was a successful night and Gillian is very proud of her performance. Once again, Gillian went to the Stone for their monthly open mic. They took a break for the month of July so she was very anxious to perform there again. She started out on her Ukulele playing her original song Turn Around, the mic was set up in a way that offered a really unique echo that really complimented the song. She then moved over to the piano to play another original titled Scars. It was a very fitting song since there is a line dedicated to her late friend Darah, who passed away 5 years ago to this day from Cancer (Ewing’s Sarcoma). She then threw in another song at the end because she felt good. She covered Trouble by Halsey for the first time ever live and was very happy with the outcome. She will definitely incorporate that song in future sets. The Manitoba Night market was tonight and Gillian had a 45 minute set at the Winners Circle Stage at 8pm. Thanks to her amazing performances at the CaRaVaN open mics, The Purple Room hired her to be on that stage! It was her first paying gig. She did amazingly well considering the heat (34 Celsius around the time she performed) and the intense wind that was drying out her throat. She still stayed on pitch and was able to alter her songs on the spot which worked out beautifully. It was definitely one of her best performances yet. After her set, she was super overwhelmed by the people who kept approaching her for the rest of the night to compliment her and take photos with her. Gillian can’t wait to have more performances like this to learn and grow from. Gillian attends the CaRaVaN Open Mic on Mondays at The Cube Stage. She tries new things every week. She has brought both her piano and ukulele with her, as well as backing tracks on her phone. Gillian is very grateful to The Purple Room for hosting the event and for always being very kind and welcoming to her. 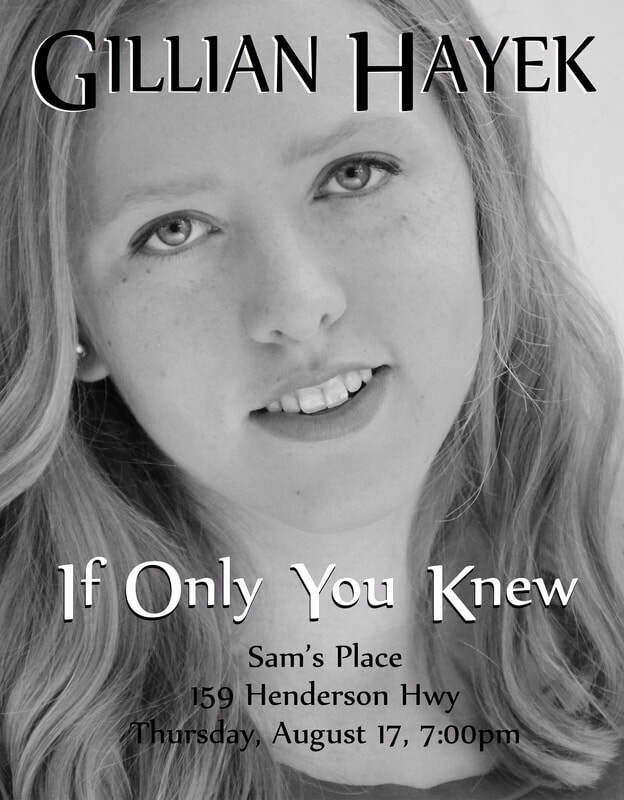 Be sure to follow her on social media (links can be found on the contact page) to be informed as to when she will be performing at this event throughout the rest of summer. The Stone held another open mic tonight! Gillian decided to utilize the house band this time and sing a cover of Radioactive by Imagine Dragons. She had a lot of fun experimenting with not being behind an instrument. She then went to the piano to perform her song Loyal once again. Gillian spent most of the day at the Andrew Dunn Walk/Run. She was setup partway through the route performing her originals and some covers for those participating in the event. Gillian stuck to vocals and piano for this gig. She enjoyed keeping her songs upbeat and being able to experiment and try new things without a constant audience watching her. The feedback received was very positive and Gillian would gladly do it again. Gillian was recently selected to be one of the 35 people to audition at the Investors Group Field to sing O Canada at the Blue Bomber home games. Her audition took place May 10th and although her nerves were at an all-time high having never auditioned for anything in person before, she left feeling very satisfied and excited for her next opportunity. Each candidate was interviewed by CBC's Wendy Jane Parker, but only three of the interviews made it to print. Gillian's was one of the three. You can find the article (and a picture of her after she sang) by clicking here (http://www.cbc.ca/news/canada/manitoba/o-canada-auditions-bombers-1.4660518). Below is a video with part of her audition. Tonight was Gillian's first open mic. Once a month, The Stone holds an open mic for any and all musicians. She decided to keep things classic by playing 2 originals, Hazy City and Loyal. The audience loved her and she is excited to return in June! The venue is absolutely wonderful and the people are even more amazing. Click here to see some exclusive footage of her performance.